A special thank you to all of our great employees that make our company a top workplace everyday! 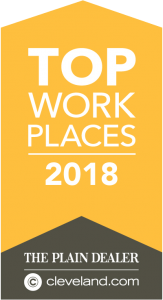 The 2018 Cleveland Top Workplace job satisfaction surveys some 44,000 plus Greater Cleveland employees at over 250 companies to determine the winners of this award. We are honored once again to be named a Top Workplace. Read More. – John Beirne, President of JPRS.